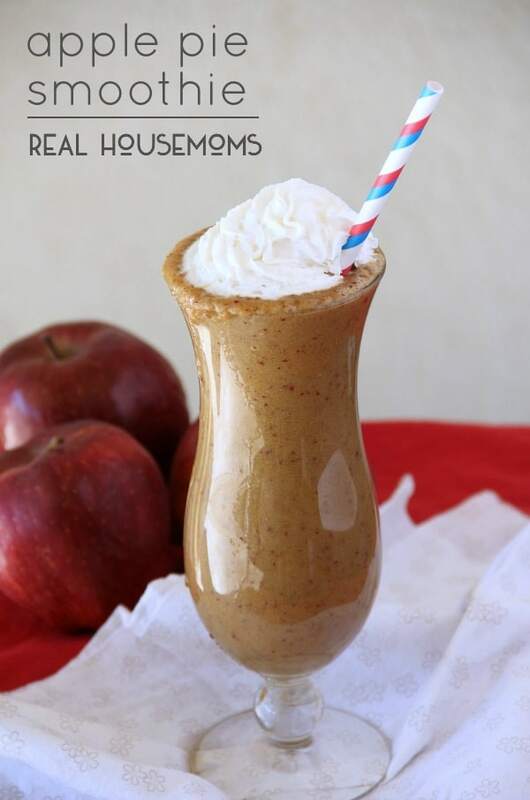 Create these easy and healthy Apple Pie Smoothies with ingredients you already have on hand. The kids will love them and you might be able to pass them off as dessert, if you are sneaky enough! Yes, I said it! 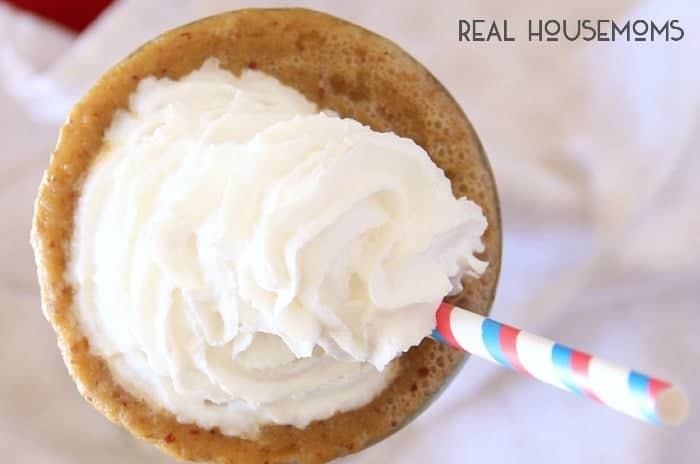 You could try to pass this smoothie off as a dessert to the kids! It tastes just like an apple pie without all hard work or fattening ingredients. I know that you can easily trick yourself into believing this is dessert…especially on a hot summer day. So instead of slaving away in the kitchen making an apple pie for your holiday parties…whip up a big batch of these Apple Pie Smoothies. I love the look of this apple smoothie. I love seeing all the red flakes of apple peel in the smoothie. I reminds me that it’s full of all that fiber and yummy fruit and not just apple juice. Also, using a high quality blender is always a bonus and the ingredients will get broken up super fine instead of leaving a bunch of lumps of apple or ice. Head over to Around My Family Table for more great smoothies like my Morning Glow Tonic or my Tropical Smoothie with Chia Seeds. I love sharing healthy and delicious smoothie recipes, so I hope you’ll pop over and check them out. 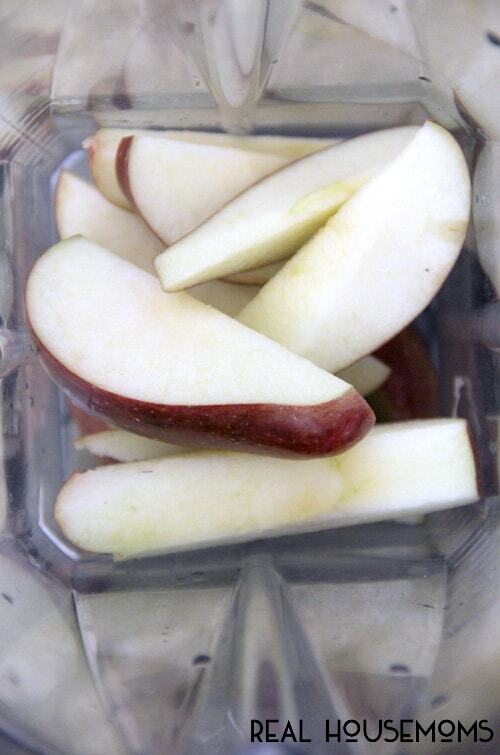 Wash and chop apple into wedges, removing the core and stem. Add apple and remaining ingredients to the blender (except ice) and process until smooth. Add one handful of ice and blend until smooth; test consistency. For thicker smoothies, add more ice and blend until smooth. Hi! I'm Wendy from Around My Family Table! I believe getting together around the supper table is important for all families. Let me help you get there faster with my quick and easy, family-friendly recipes. Just stumbled this on Stumble Upon, thanks for sharing friend. This is a good recipe to try. It was a little too sweet for me but the kids loved it. I would probably add honey or banana to it. The consistency is really thick but other that it’s pretty good and it only took about 5 min.